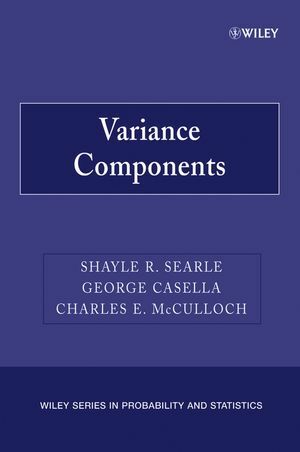 This book focuses on summarizing the variability of statistical data known as the analysis of variance table. Penned in a readable style, it provides an up-to-date treatment of research in the area. The book begins with the history of analysis of variance and continues with discussions of balanced data, analysis of variance for unbalanced data, predictions of random variables, hierarchical models and Bayesian estimation, binary and discrete data, and the dispersion mean model. SHAYLE R. SEARLE, PhD, is Professor Emeritus of Biometry at Cornell University. He is the author of Linear Models, Linear Models for Unbalanced Data, and Matrix Algebra Useful for Statistics, all from Wiley. GEORGE CASELLA, PhD, is Professor and Chair of the Department of Statistics at the University of Florida. His research interests include decision theory and statistical confidence. CHARLES E. McCULLOCH, PhD, is Professor of Biostatistics at the University of California, San Francisco. He is the author of numerous scientific publications on biometrics and bio-logical statistics. He is a coauthor, with Shayle R. Searle, of Generalized, Linear, and Mixed Models (Wiley 2001).